Hello! 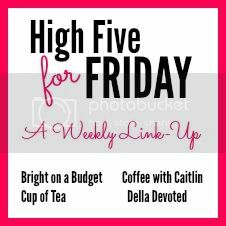 I haven't done a High Five For Friday post for 2 weeks so I am going to recap the top 5 moments of the past 2 weeks! 1.) I had a great visit with a good friend and her kids. Miss. E and my friend's kids played so well together. She and I got a good visit in. It was wonderful and I really cherish the time that I get to spend with close friends. 2.) We spent the weekend in Hubby's hometown. We saw both of his Grandmothers, his Godmother, his friend and his family. We had a lot of fun! My in-laws happily babysit Miss. E for us while Hubby and I went on a lunch date. It was really nice to see everyone and to steal away a little time for ourselves, as well. 3.) Miss. E has become quite the helper lately. 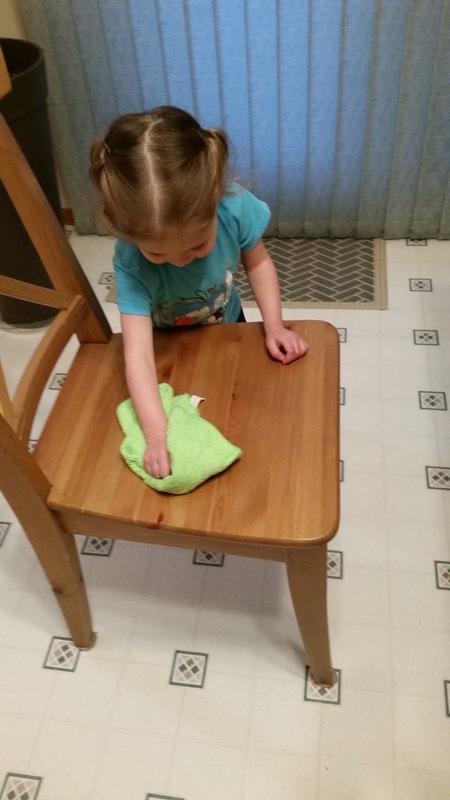 She loves to fold washcloths and wipe down furniture for me. I can only hope that she retains a sliver of this enthusiasm when she is older! 4.) The promotions for the new Beauty and the Beast movie have begun! Eeeeeeeeeek!!!!!!!!!!! I am so excited. Belle is my favourite Disney princess (bookworms, unite!) and I can not wait to see Emma Watson in the role! 5.) It was Bell Lets Talk day in Canada on January 25. It is a day that aims to promote awareness about mental illness, while raising money for mental health programs in Canada. It is a really important initiative. It is imperative that mental health conversations become normalized and that the stigma of mental health issues is eliminated. Mental health is as important as physical health. If you or someone you love is struggling, please seek help. For more information, please visit the Canadian Mental Health Association or Bell Let's Talk. 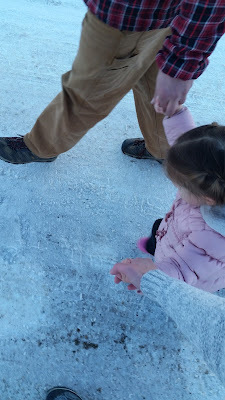 Family walk to the library. Have a fabulous weekend! If you want to read some great posts from some great bloggers, check out the link below! I had never heard of Bell Let's Talk Day, but saw it on Instagram the other day. I love that there is a day promoting awareness for mental health. That seems to always be such a taboo topic, but more people need to speak up. It is so very true. The more that we talk about it, the more "normalized" mental health issues become. It would take a lot of the fear and stigma away from people who are wanting/needing to seek help. We are so excited for the new Beauty and the Beast movie! I think it's going to be really good. It looks fabulous! I can't wait to see it!